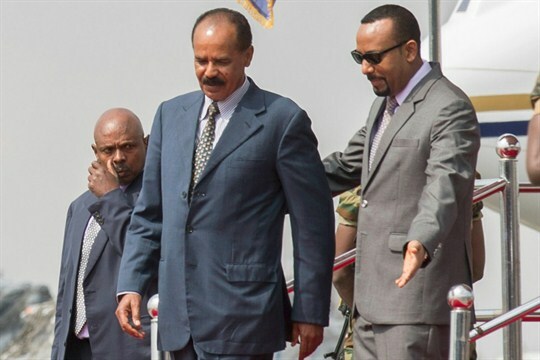 Eritrean President Isaias Afwerki, left, is welcomed by Ethiopian Prime Minister Abiy Ahmed upon his arrival at Addis Ababa International Airport, Ethiopia, July 14, 2018 (AP photo by Mulugeta Ayene). Since Abiy Ahmed became prime minister of Ethiopia a year ago, domestic and foreign observers have heavily scrutinized his political reforms and, especially, the peace deal he reached last year with Eritrea. But the changes he’s introduced extend farther afield. On the foreign policy front, Abiy has demonstrated a willingness to engage with wealthy Middle Eastern countries on the other side of the Red Sea, dismissing his predecessors’ wariness of becoming entangled in the region’s politics. Evidence of this engagement was first apparent in the role that Gulf countries, especially Saudi Arabia, played in brokering the Eritrea peace deal. It has also translated into the pursuit of investment projects and port deals that could give Ethiopia, the world’s most populous landlocked country, a direct path to the sea. Yet in some areas, notably the conflict in Yemen, Abiy has refrained from taking concrete positions. Some analysts, diplomats and officials in Addis Ababa worry that in focusing on the rewards these partnerships offer, Abiy is overlooking the risks they pose. In this week’s interview episode of the podcast, Daniel Benaim, a senior fellow at the Center for American Progress, talks with WPR’s senior editor, Robbie Corey-Boulet, about Ethiopia’s evolving Middle East policy, what it means for the Horn of Africa, and how the United States should tailor its outreach to the region.